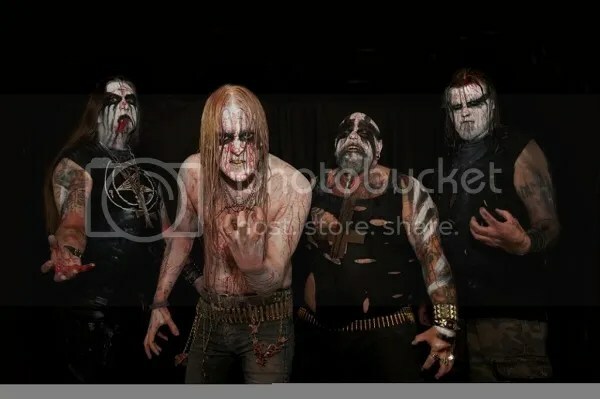 Norwegian Black Metallers RAGNAROK have announced an amicable parting of the ways with their frontman Hans Fyrste. Fyrste, who has been with the band since 2005 and performed vocals on two of their seven full length albums – 2010’s “Collectors of the King” and the latest release “Malediction” – is cutting back on his musical activities due to other personal and job-related commitments, which had already affected his ability to tour with RAGNAROK at the end of last year. His last live appearance with the band was at this year’s Blastfest festival in February. In a statement the frontman explained his decision: “The decision to leave RAGNAROK, has been an extremely hard one to make. Jontho and Brigge brought me in to the horde in 2005, and this still stands as my biggest achievement as a musician. Personal circumstances have made it so that I will not be able to dedicate myself to RAGNAROK, as much as it requires. It is with a heavy heart that we have come to an agreement, and I am pulling out of the band. “All words fall short compared to how grateful I am for have taken part in this journey.Over the years we have experienced so many great achievements, and I would never have been without any of them. Being able to tour around the world, from Siberia to Rio de Janeiro, with supporting, passionate and faithful friends and fans in every city, has been a humbling experience. Every step of the way has also brought with it impressions, educating me to be a stronger person. Also learning so many new things, evolving to be the vocalist and human being I am today. “I would like to take this opportunity to thank everybody who has made this journey possible. Without all my great friends and fans out there, nothing of this could have ever happened. Thank you! And finally, of course, thank you Jontho, DezeptiCunt and Bolverk. Thank you for all the great times on and off the stage. Thank you for everything we have gone through together. Thank you for the brotherhood and support! I leave RAGNAROK as a humble man, and wish my brothers all the best in the future. Founder and drummer Jontho had this to say about Fyrste’s departure “After 20 years you come to expect these things as an inevitable part of being in a band. Sooner or later there comes a time when all musicians must take a hard look at their lives and take decisions based on family and work commitments. Hans Fyrste felt that he could not give the amount of dedication that RAGNAROK asks of its members, and that it would be fairer all round to call it a day, and that is very much to his credit. He has been a real asset to the band. We have watched him grow over the years to become a great frontman and we wish him all the best for the future”. Formed in 1994, and celebrating their 20th Anniversary this year, RAGNAROK are unfazed by the departure of their frontman and have begun work on what will be their eighth full-length album. The band played their first North American show in November last year, and are scheduled to headline at the Sick Midsummer Festival in Austria in July. They have not yet disclosed who will replace Hans Fyrste in the lineup, which, aside from Jontho on drums, includes DezeptiCunt on Bass and Bolverk on guitars. “Let’s just say that we are looking at various options, some of which might come as a bit of a surprise to RAGNAROK fans, but we’re not prepared to say more at this time”, commented Jontho.